Holographics Inc. 44-01 11th Street, Long Island City, New York, USA. University of Portsmouth, School of Computing Studies and Mathematics, UK. A new computerized NDT system based on an acoustic impact technology has been demonstrated to detect defects in composite structures, delaminations in bonded metal and corrosion in aluminum. The system is totally remote and requires no physical contact with the object undergoing testing; it has been demonstrated to operate at a stand-off distance of three meters. The system employs a proprietary design acoustic transducer which produces an air coupled shock or pressure wave, similar to that produced from a small explosion. This is achieved by discharging a high voltage capacitor within a period of less than 5 microseconds. The discharge is contained within a small ceramic chamber with an annular design anode providing an exit for the resultant hot gasses. The result of this configuration is that a single brief, but extremely high velocity shock wave of broadly unidirectional characteristics is launched into the air and used to impact and excite the object undergoing testing1,2. The objective of the brief impact is to excite natural relaxation frequencies in the object and avoid any "blanketing" effect that would be present if continuous wave white noise was applied. Surface relaxation frequencies for any given material are dependent upon the underlying substructure of the object. 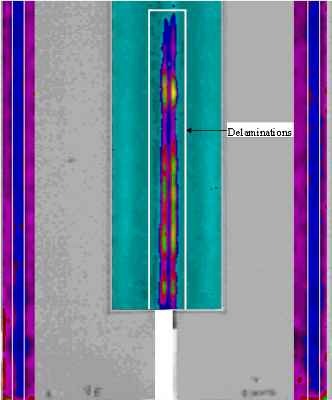 Remote interrogation of the relaxation frequencies on the surface of the object undergoing NDT is accomplished with a highly customized scanning laser Doppler velocimeter employing specially prepared analysis programs. The technique depends upon the hypothesis that any change in substructure will locally affect the surface frequency response spectrum. A very limited analogy is tapping a surface with the edge of a coin: If there is a subsurface defect such as a debond, then the resulting relaxation frequencies make a hollow sound. However, audible responses are very difficult to quantify under any circumstances and furthermore, physical contact is not always an option. An important aspect of this technique is that it does not limit itself to the excitation of a single spot, but impacts a large area of the structure. Surface relaxation frequencies excited in the object under going testing occur as out of plane displacement and are analyzed with a scanning laser Doppler vibrometer. An analog velocity time domain signal received from each data point is passed into the processing computer where it is immediately processed to a Fast Fourier Transform (FFT), which is effectively a frequency spectrum over the bandwidth recorded. This data is then stored in the computer as individual frequency bands. 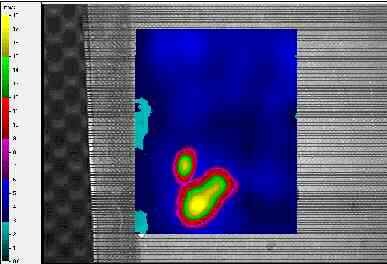 The data is later analyzed to select the relevant information carrying frequency bands and a velocity based image is computed and presented on a monitor overlaid on an image of the object which was simultaneously grabbed by a CCD camera. A program of data reduction, which is currently being developed, will analyze the vast amount of data recorded and quantify the results. Fig 1: Optimized presentation of scan result employing "Selective RMS" procedure. Figure 1 is a record of a defect in a 12 mm thick carbon/Nomex honeycomb. To show the potential of this technique we have recorded the image from the rear with respect to the defect. Thus the data is recorded through the thickness of the honeycomb. For obvious reasons we call this the "Bunny" and by a carefully designed program of data reduction called "Selective RMS" we have characterized the shape of the defect. In brief, because different regions of the Bunny respond at different frequencies and thus recorded in different regions of the FFT spectrum, it was necessary to devise a technique to select only the information carrying frequencies whilst rejecting the remainder in order to make a composite image fully showing the shape of the defect. Furthermore, the frequency information retained in the data scan can effectively be used to characterize the depth of the defect. This maybe more clearly understood when the section which deals with the quantification of corrosion in metal is discussed below. This system of NDT has been applied to subjects with extremely high acoustic impedance. Figure 2 shows a delamination in the fixing of a 50 mm thick ceramic heat shield tile of the type used to protect the Space Shuttle craft during the re-entry period. This material is a soft ceramic with a high porosity. It is mounted, with a resin bond, to a honeycomb isolation layer located between the aluminum shell of the Shuttle craft and the tile. The purpose of this is to isolate the tile from the shell in order to overcome the difference in the coefficient of expansion of the two different materials. This does make for a complex situation for the detection of delamination. Another material tested which also has a high acoustic impedance is the new carbon foam which is being used to replace honeycomb in complex shape situations. Our sample was tapering and about 40 mm mean thickness. We were able to detect the defect from the rear looking through the total thickness of the foam3. We have also applied this technology to the analysis of bond defects in metal structures in the aerospace industry. Figure 3 shows the cross-section of a metal helicopter blade. The integrity of the structure very much depends upon metal to metal bond strength. Fig 3: Cross-sectional view of the helicopter blade. We developed what we have termed an "unwrapping" technique which permits the blade to be scanned on both sides and the leading edge in a single record. The blade was cut into three sections for ease of shipping. Figure 4 shows a delamination in the leading edge of a blade section, whilst Figure 5 shows another section of the blade with three delaminations on the rib region. Fig 4: Unwrap presentation of helicopter blade showing delamination on the leading edge. Fig 5: Unwrap presentation of helicopter blade showing 3 delaminations on the rib section. 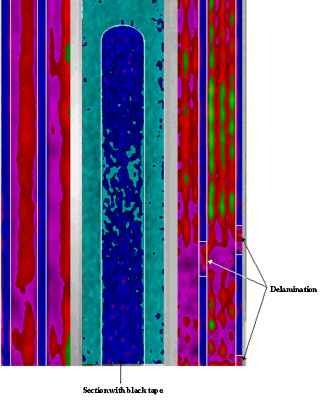 Fig 6: "Selective RMS" presentation of all the corrosion spots which were detected. We have outlined the sub-structures on the record for the sake of clarity. The real problem here lays in the fact that there is a sharply curved leading edge, with a non-constant curvature and of varying stiffness, which radically affecting the relaxation frequencies as the analysis progresses round the curve. (There can be some difficulty in seeing these defects clearly because of the black and white presentation. All our original velocity maps are in color). We are currently attempting to apply this new technology to both the detection and quantification of corrosion in aluminum structures such as lap joints found in the aerospace industry. Corrosion is a serious problem in air transport fleet which is rapidly aging. The average age of fleet aircraft is over seventeen years4. For example the Concord is now over 20 years old. There is a need for a technique both for the rapid and efficient detection of corrosion and its quantification in terms of metal losses. Our NDT technology was applied to an aluminum lap joint obtained from a Boeing 707 aircraft. Figure 6 shows the "Selective RMS" image of the corroded region in this joint. The image is a composite of several groups of frequencies. It is from this FFT information that we suggest we are able to compute metal losses in the region of the corrosion. An FFT applied to this situation can be considered as a frequency spectrum with a predetermined number of discreet frequency lines of information over the chosen frequency range. An alternative way is to describe it as a data stack with potential image forming data in the horizontal X&Y axis and frequency information in the vertical or Z axis1 as shown in Figure 7. For simplicity, the diagram only shows three primary areas of a complex situation in which image information was contained in groups of frequencies ranging from 10 kHz to 25 kHz. Fig 7: Schematic representation of the random noise, bending modes, and signal in the frequency spectrum obtained in a typical scan. 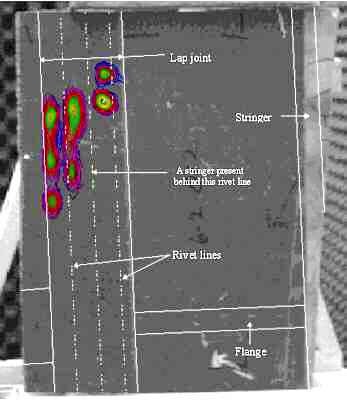 Fig 8: Boeing 707 panel: An area of corrosion detected between 15.5 kHz and 17 kHz. Figure 8 is an example of one group of frequency band that were chosen by the application of the "Selective RMS" technique. 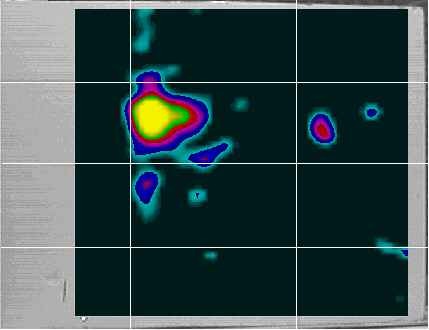 The image here has not been smoothed and the individual data points that was acquired during the original scan are seen. The FFT of each of these data points is stored in the computer and may be recalled either by an automatic program or manually displayed simply by placing the cursor on the data point. In the diagram, we have chosen a central point in the vibrating antinode (region of corrosion) and another of a non-corroded region. Figure 9 shows the corresponding frequency spectrums at these two points, plus another from a different corroded region. It will be seen that in the corroded regions there are peaks at specific frequencies. Our results indicate that with these information it will be possible to derive an algorithm which will compute the metal losses for any particular region. It is really a function of frequency being a result of stiffness due to defect size and meal loss. We have demonstrated that this non-contacting acoustic impact system can operate from large stand-off distances and detect defects in various composite materials and ceramics with high acoustic impedance which essentially preclude ultrasound. Additionally the technique has been applied to bonded and riveted aluminum structures such as those used on the present air transport fleet. The technology has been demonstrated to detect delaminations in metal without difficulty. Webster et al., "Method & Apparatus for Non-Destructive Inspection of Composite Materials and Semi-Monocoque Structures", US Patent No. 5,505,090. 1996. Webster et al., "Acoustic Wave Generating Apparatus", US Patent No. 5,616,865. 1997. 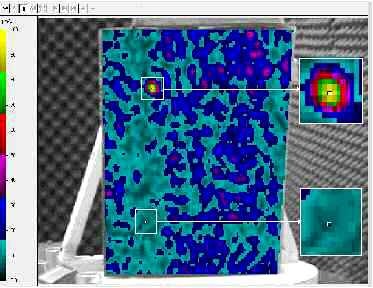 Webster et al., "An optical/acoustic technique for the detection and imaging of subsurface defects in composite structures using remote laser doppler", Journal of Imaging Science, RPS, Vol.46, No. 1, 1998. Kizer, C. R. ATAL/AIA Air worthiness Task Force, Proc. of 2nd Annual International Conference on Aging Aircraft, Pg. 36, 1989. This work was sponsored by DARPA Phase II # DAAH01-95-C-R182 Contract "Development of an Optical/Acoustic Method for the Remote Non-Destructive Inspection of Large Area Composite Materials for Structural Defects". Approved for Public Release Distribution Unlimited. Dr. Webster is the Vice President for Research and Development for Holographics Inc. which is a small research company based in New York. He also has an active involvement with several academic bodies around the world. His specialized field is laser development and imaging inspection systems which he has applied to a wide variety of field of applications. These have ranged range from the inspection of nuclear reactors and the restoration of ancient artifacts. His present field of NDT research is closely associated with the aerospace industry for the detection and quantification of hidden corrosion. Dr. Thevar is a Research & Development Engineer at Holographics Inc. He gained his honor degree in Electrical Engineering and Ph.D. in Laser Engineering, both from the University of Aberdeen, UK. His research interest is in the area of solid-state laser development and laser applications in non-destructive testing. Mr. Kalshteyn is a Research & Development Engineer at Holographics Inc. He holds BS and MS in Physics, both from former USSR. He has a vast hands-on experience in design of scientific instruments, electronic circuits and laser systems. For the last 8 years Jackie Mew has worked at Portsmouth University as a senior lecturer in Computer Science, teaching undergraduates and post-graduates. Her research area is in computerized data analysis, particularly data derived from scanning laser Doppler as applied to Non-Destructive Testing (NDT) of composites and aluminum structures. Prior to this she was instrumental in introducing Personal Computing into a Local Authority during the early 1980s, and has worked as both as a programmer and computer systems designer, as well as in other educational establishments.